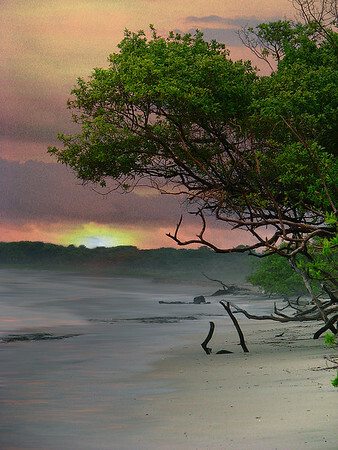 My first trip to Costa Rica was in 1995, and most of the trip was spent in Tamarindo. It quickly became my favorite place on earth. Everyone was unbelievably friendly and the atmosphere was super relaxing. It was just locals and surfers. Going back to Tamarindo in 2007 was…well…upsetting. I think it has definitely earned the name Tamagringo – it is too much on the commercial side now. It is still a great place to visit, but not the Costa Rica I knew. I took this trip with my parents and little brother, and I think we all felt the same way about Tamarindo. I have not scanned photos from the 1995 trip, but this gallery was all shot with a Canon S5 IS – my thoughts on using this camera. Fortunately, we were able to find another place that is very much like the old Tamarindo, but smaller. The waves are much better there too, and it is nothing but surfers. The place is called Playa Avellana; which is about a 15 minute drive from Tamarindo. I will not go to Costa Rica again without staying in Avellana. I also wouldn’t make another trip to CR without rafting down the Pacuare again. I’ve done it on both trips, but on this last trip we spent 3 days there. The Pacuare Lodge is incredible! It is one of those places where you can totally divorce yourself from society, becoming immersed completely in nature. It is difficult to put Pacuare in words – it is one of those places you just have to experience for yourself. If white water rafting in up to class 4 rapids, swimming in waterfalls, eating the freshest food, or just getting back to nature is your thing, put this place on your “bucket list”. We had two weeks to play in Costa Rica, and a lot of places to visit. I had never been around an active volcano before, so one of those stops was the Arenal Observatory Lodge. The whole time you’re in Arenal, you hear the popping of the volcano almost all the time. If you’re lucky, you’ll see some lava “pops” erupting from the top followed by red balls of molten rock tumbling down the side. If the popping isn’t enough noise, there are howler monkeys and the world’s largest population of migratory birds all around. 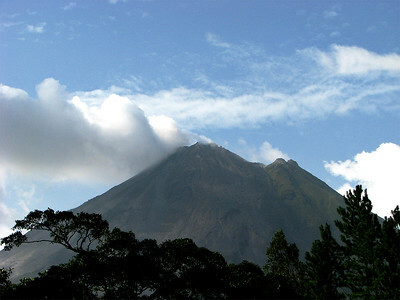 If you want to get some shopping done, around Arenal, there is La Fortuna. We found a great roadside restaurant where I highly suggest Canada Dry ginger ale in the bottle and Pineapple smoothies. Just don’t eat the beef – it isn’t aged the same way as it is in the United States. One of the neatest things about being near a volcano are the hot springs. There are tons of places around to relax in the hot water, but if you want the best, go to Tabacon. There are numerous springs built around the height of naturous-luxury. If I haven’t sold you on Arenal, there are the hanging bridges to consider. This is where a lot of photography opportunites can be found. It is essentially a path through some of the deepest jungle Costa Rica has to offer. The capital city of Costa Rica is where we start and end. The main airport is there and it is easy to find a rental car. My only advice on rental cars there is to make sure you get something with some decent suspension – typically a SUV of some sort. Spend the extra money to upgrade because the small SUV’s will beat the teeth out of your head. I have never been on a road in the United States that is as bad as many of the roads in Costa Rica. Roads are much better (some are even paved) than when I originally visited, but they’re still pretty bad. I wouldn’t plan a trip just to see San Jose. There really isn’t anything there to see. 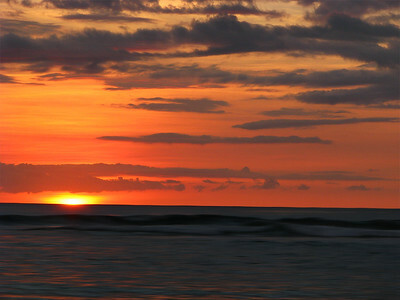 Costa Rica is still one of my favorite places on earth, and one that I will visit again.